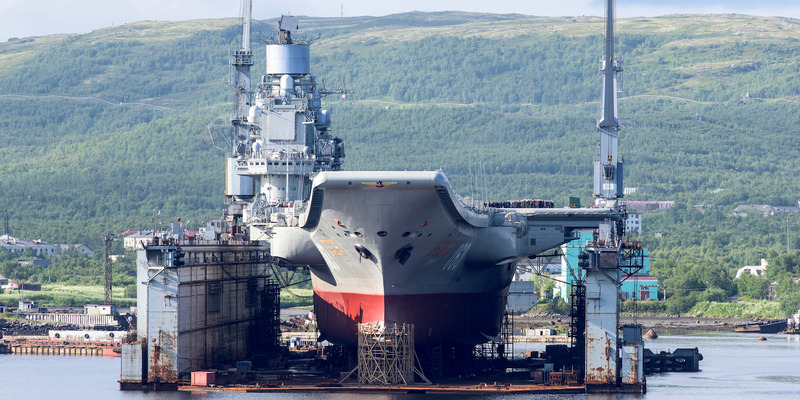 Russia’s only aircraft carrier, the Admiral Kuznetsov, sustained massive damage from a 70-ton crane falling on it after an accident at a shipyard, Russian media reports. The Kuznetsov, a Soviet-era ship already known for having serious problems, now has a massive 214 square foot hole in its hull after a power supply issue flooded its dry dock and sent a crane crashing down against it. Russian media cited sources as saying the hole wasn’t a big deal and could be quickly fixed, but the Kuznetsov has long had serious operational problems. “The crane that fell left a hole 4 by 5 meters. 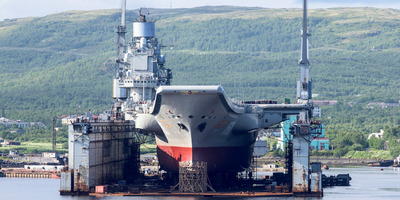 But at the same time … these are structures that are repaired easily and quickly,” Alexei Rakhamnov, the head of Russia’s United Shipbuilding Corporation, told Russian media. The aircraft carrier had been in dry dock for total overhaul slated to finish in 2020 after a disastrous deployment to support Syrian President Bashar Assad saw it lose multiple aircraft into the Mediterranean and bellow thick black smoke throughout its journey. The Kuznetsov rarely sails without a tugboat nearby, as it suffers from propulsion issues. Russia has planned to build a new aircraft carrier that would be the world’s largest to accommodate a navalized version of its new Su-57 fighter jet. However the Su-57 may never see serial production, and only 10 of them exist today. Analysts who spoke to Business Insider say the use-case for the Su-57 doesn’t make sense, and they doubt that it will become adapted to carrier launch and takeoff. Russia frequently announces plans to create next-generation weapons and ships, but its budget shortfalls have caused it to cut even practical systems from production. As Russia has no considerable overseas territories, it’s unclear why it would need a massive aircraft carrier.